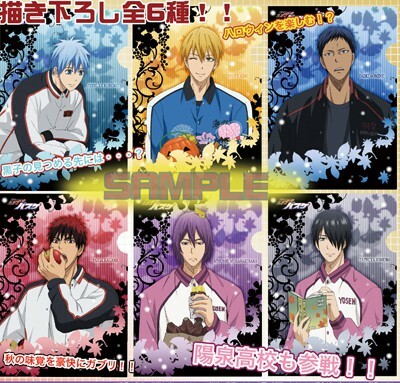 STICK POSTER TENIPURI FESTA 2013, KUROBASU MINI CF AUTUMN PREORDER!!! PREORDER CLOSED! PLEASE SEE MAIN SALES FOR AVAILABLE ONES. The Tenipuri Festa 2013 Stick Poster collection is up for sale!!! Again, there is a shiny pearl version and a normal version. $10 a piece as always, make your reservations!!! Will order on 10/31 or earlier if it looks like they are selling out. TWO BOXES HAVE BEEN ORDERED! GO AHEAD AND MAKE YOUR RESERVATIONS! Can I reserve Yukimura and Tezuka shing pearl verison? asdfjkl; I can't believe they're selling these! Please put me down for a shiny Niou, please? Pwetty pwease with a cherwy on top? ꒰ ˘͈௰ ˘͈ ૢ꒱ Oh, also a shiny Kintarou as well because when I showed my sister that there will be one for Kintarou as well, this was basically her reaction -> ✧･ﾟ: *✧･ﾟ:* \(⊙ω⊙✿)/ *:･ﾟ✧*:･ﾟ✧ Sparkles and everything. LOL!! I just updated the post with KuroBasu as well if you're interested!! Would it be possible for me to be added for Kagami, Aomine & Himuro? TY! Sure thing! They are all yours ^___^ Ah, they will be shipped in Nov, so I'll get them by Dec.
LOL I love how you put my name with a question mark behind it. Please do keep the perfect pair for me! Thanks! Okay! LOL, I'll remove the question marks now!! Is there no clearer/larger preview for atobe stick poster? :( idk if i want it base on the small preview..
Ummmm.... Shiny Niou has already been claimed. There's only normal Niou if you want him.